Dj since 1988 / Producer / A.R. and Label Manager at Logical Records Spanish Booking: 680588802 Javier_busto@telefonica.net International Booking: Julie-Ann Smith Julesjules06@gmail.com (English) English: At only 16 years of age Javier Busto jumped into the DJ booth for the first time, mixing the most acid and striking sounds of the moment. Shortly after he began his residency at Saratoga, club clearly stamped his style. 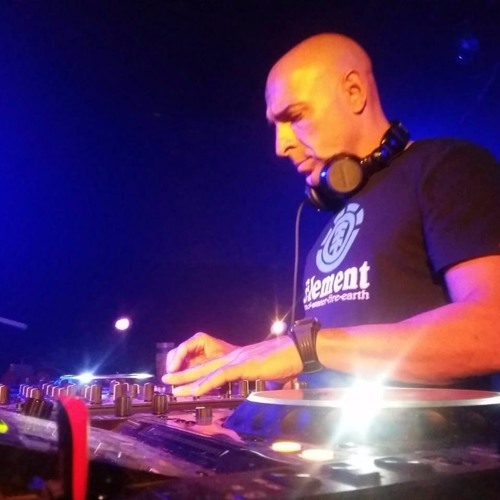 Javier has gone through a broad variety of music styles during his 25 year on the decks , EBM, New Beat, Techno, Trance, House, Deep House, Tech-house. A wide variety of rhythms, melodies and percussion, have always been present in his sets, having evolved over the years into a Dark Disco, Electronic, Slow Techno, New wave, Psycho Disco, Cosmic Disco and other styles with clear touches of electro, acid, without abandoning its melodic and rhythmic essence. In the 90's has established itself as a resident in renowned clubs like Pacha Villalba, Broker, Boss, Oh! Sierra, and plays various nights in clubs throughout the nation such as Zoo (Pontevedra), Spit Madrid, Archy, Oh! Madrid, Oh! Marbella, Mondino, Area Local(Valencia), Melody (Albacete), and finally took up residence in Jake. Clubs: 1987 - 1989 La Nuit (Madrid): Acid House, E.B.M, New Beat 1989 - 1992 Saratoga (Madrid) Technho Industrial, E.B.M., New Beat, Synth Pop, Gothic Rock 1992-1993 La industria (Coslada) Spit (Madrid). New Beat, Trance, Techno 1993-1995 Boss (Villalba) Trance, techno, E.B.M., Progressive 1995-1996 Oh!! Sierra (Villalba) Progresive, house, tech-house 1996 - 2000 Jake (Alcobendas) Techno, Trance, Progressive, House, Deep House 2010: D-14 Private Club 2011: TRIBECA MADRID 2012: LOVE HOTEL MADRID 2013: MONDINO 2103: KEEPER (Madrid) 2014: REMAKE (Madrid) 2014: EVARISTO CLUB 2014: MACARENA CLUB (Barcelona) 2015: CAFE LA PALMA (Madrid) 2015: STUDIO76 (Madrid) 2015: AVALON (Madrid) 2015: UKIYO CLUB (Dublin) 2015: MORODER SOUND CLUB (Madrid) 2015: EVARISTO CLUB (Madrid) 2016: TABOO MADRID 2016: REPULIK SOUND CLUB (Madrid) 2016: INTERCLUB - EL SOTANO (Madrid) 2016. SMILE FRIDAY DISCO PARTIES (Traveller - X) 2016: ENDIT CLUB (Madrid) 2016: MORODER SOUND CLUB (Logical Records Showcase) 2106: CRACK BELLMER (BERLIN)(Logical Records Showcase) 2016: UKIYO CLUB (DUBLIN) (Logical Records Showcase) 2016: CASINO CLUB (BARCELONA) 2016: WHITE CAT (BRUSSELS) 2016: TRES (BARCELONA) 2016: THE MASH HOUSE (EDINBURGH) (Logical Records Showcase) 2016: CHROMATIC (VALENCIA) (Logical Records Showcase) 2016: REPUBLIK / DUAL (MADRID) 2017: IBOAT / ESTETIQUE (TOLOUSE)(Logical Records Showcase) 2017: BLACK DOOR / COMETE COMETE (DONOSTIA) (Logical Records Night) 2017: STUDIO76 (Madird) 2017: CAFE LA PALMA (Madrid) 2017: MORODER SOUND CLUB (Madrid) (Logical Records Night) 2017: CAFE BERLIN (Madrid) (Logical Records Night) Spanish Booking: 680588802 Javier_busto@telefonica.net Español Con tan solo 16 años (1988) , se sube por primera vez a una cabina para hacer sonar los ritmos mas acidos y contundentes del momento. En poco tiempo comienza su residencia en Saratoga, sala que marca rotundamente su estilo. Este madrileño, durante sus 25 años de trayectoria, ha pasado por una gran variedad de estilos musicales: EBM, New Beat, Tecnho, Trance, House, Deep House, Tech-house. Un alto contenido en ritmos, percusiones y melodías, han estado siempre presentes en sus sets, habiendo evolucionado, con el paso de los años, hacia el Dark Disco, Electronica, Slow Techno, New wave, Psycho Disco, Cosmic Disco y otros estilos cargados de percusiones, a un tempo bajo de BPM´s En los 90´s se consolida como residente en discotecas de renombre como Pacha Villalba , Broker, Boss, Oh!! Sierra, y realiza sesiones por distintos clubs a nivel nacional: Zoo (Pontevedra), Spit Madrid, Archy, Oh!! Madrid, Oh!! Marbella, Mondino, Zona Local (Valencia), Melody (Albacete), para finalmente establecer su residencia en Jake.